Imagine getting the opportunity to hold a private photo session with David Bowie at the height of his stardom. We’re talking post “Ziggy Stardust” and “Aladdin Sane,” with “Pin Ups” and “Diamond Dogs” still on the horizon. Imagine you had an entire evening to play dress up with the iconic shapeshifter and capture the manifold personas he embodied so swiftly yet completely. And suppose, over 40 years later, after the iconic artist’s death, you return to those photos you took so long ago and notice what seems to be a message. 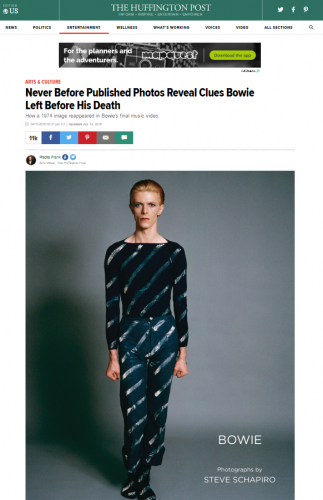 A message that reappears throughout his later works, culminating with the “Lazarus” video off his final album “Blackstar,” that perhaps illuminates the artist’s feelings about death and immortality.